One visit to Chin Chin and I knew that Benjamin Cooper was a god, okay maybe not a god but he has some godly abilities wielding a wok and a pressure cooker. There really is only one way to go for menu choices at Chin Chin and that is the feed me option where an endless parade of modern Asian dishes will pass by your table and leave again ravaged, unrecognisable from their original state. All that will be left are the smears that your fingers could not scrape off your plate. You may line up for hours on end or drink yourself into a semi drunk state in the Go Go bar downstairs waiting for your table if you leave your arrival to late but trust me, it is worth it. Once you have devoured the divine offerings and surprisingly not been robbed of all your wallets contents at the register you should absolutely grab a copy of the Chin Chin cookbook on your way out the door. You may never be Benjamin Cooper himself. Your tattoo quota likely never high enough, your hair just doesn't seem to stand up on end the right way and the air of awesomeness you exude will never be palpable but you can have a crack at cooking like him, tattoos or not. 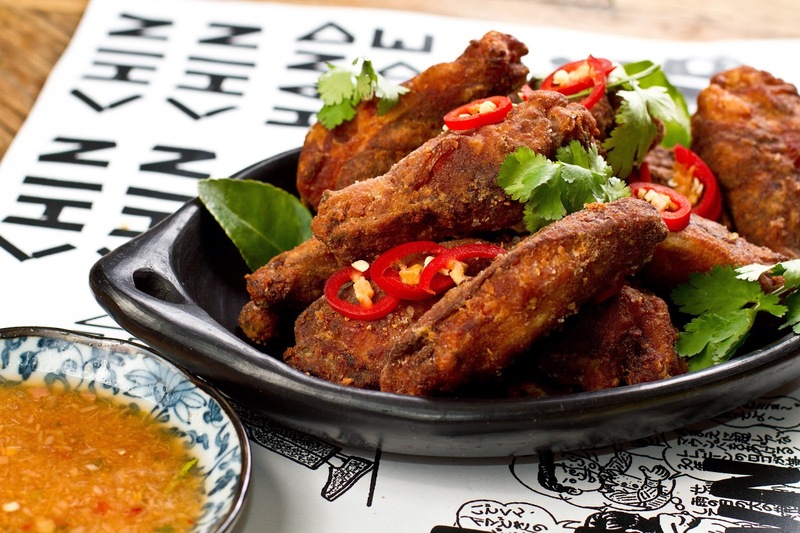 Whilst perusing the book and considering if I was worthy of attempting any of the uber cool recipes inside I found a recipe for Chilli-Salt Chicken Wings and a sauce named Bandit Sauce. That sounded like something I could master in a relatively short amount of time. The overall process was a little more involved than at first blush and after a number of hours a making a master stock, simmering the chicken wings in the master stock, pounding the bejeezus out of a long list of ingredients for the bandit sauce and battering and deep frying the wings I scrapped all other plans for any other food that day and decided the wings were it. Luckily the moist tender chicken with it's crispy coating and the super sour punch in the face bandit sauce were enough to satisfy the soul. This cookbook is deceptive at first. I would not recommend a first timer launch headlong into it without some careful reading of the full recipe and additional techniques. Whilst the guide to cooking time and difficulty seems like a handy little tool it doesn't actually take into account the additional recipes that are required to make the finished product. Many of these recipes appear tucked away at the back of the book, for example you need to make a master stock to complete the chilli-salt wings but the presumption is we would already have staples like this pre-made so the cooking of this is not factored into the guide given at the bottom of the recipe. I don't know about you but rarely would I have a ready to go home made master stock lurking in my freezer. A little cheeky really but hey, if you look at Benjamin Cooper and not think he might be a little cheeky then you might need your head checked. I was also surprised that the book also contained recipes for some of the delicious meals we were served up in the restaurant. Clearly not one afraid to give away his secrets, probably as he knows that a home cook will never nail it to his standards anyway. My recent penchant for raw fish found it's nirvana at Chin Chin with it's Kingfish Sashimi with Thai flavours and lo and behold the cookbook contains the recipe, score! This book surpasses any need for me to rate it, it speaks for itself. If the glory hidden in it's pages doesn't leave you gagging for more hours in the day to conjour up it's recipes or an abode closer to Chin Chin itself I will be shocked. Any self respecting home cook should have a copy, boot out that old copy of "The Joy of Cooking" and make room for the mohawk wearing bad boy of Asian cooking, Benjamin Cooper.